As far as major protests go, the United States experienced a period of relative quiet from 1980 until 2011. For 30 years after Ronald Reagan broke the PATCO strike, “class war” in America was largely one sided. America’s working class took hit after hit without much in the way of a response. 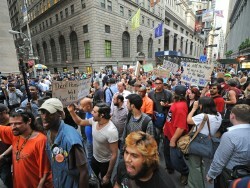 While Occupy Wall Street has been in the news of late, uprisings of the American working class are actually nothing new. In fact, the United States boasts a long track record of actions against corporations and the government. Here are 11 of those uprisings that Occupy Wall Street protesters and everyone else seeking social change would do well to study. Each of these movements won lasting social change. Their failures and limitations provide lessons about what not to do, while their successes offer a guide to future action. Some of America’s earliest labor strikes, the Lowell Mill women’s strikes bear more than passing similarity to contemporary events. A booming economy led to plentiful jobs with higher wages. When the economy cooled, capital imposed a 15 percent wage cut at the Lowell mills. There wasn’t even a word for “strike” yet, but the overwhelmingly female workforce did just that. The first strike in 1834 failed, with women heading out of town or returning to work at poverty wages. While the 1834 strike failed, women learned lessons from the bitter, pitched battle in the streets of Lowell, MA. By 1836, the economy degraded further. A rent increase at company boardinghouses acted as the spark to the powder keg. Women formed the Factory Girls’ Association to lead another strike. The second strike lasted several weeks, ending with a victory for the mill workers. The significance of the Lowell Mill Strike of 1836 lies beyond merely defeating a rent hike. The strike won broad community support, a strategy essential at winning strikes. It was also the first time a woman spoke in public in Lowell. The strike stands as an early example of the power of organized labor, and offers lessons for how labor can draw in the broader community. Finally, the organized withdrawal of funds from local banks finds echoes in today’s “Move Your Money” movement, where people withdraw money from corporate banks, moving them to community banks and credit unions. The postbellum political and economic landscape was a brave new world for everyone. With slavery demolished, Union and Confederate soldiers returned, overflowing the labor market. By 1873, the Long Depression (known as the Great Depression until the 1930s) of Europe infected the United States. The rapid, unrestrained growth of the American economy, built on the expansion of rail, ground to a dead halt. Add to this an election many considered rigged or stolen and some kind of social unrest was a foregone conclusion. When the Baltimore & Ohio line cut wages for the second time in a year, the nation exploded. Centered in Maryland, Pennsylvania, Illinois and Missouri, the Great Railroad Strike was no friendly, police-approved picket line; it was more analogous to the Great Slave Rebellion of Spartacus. Rail traffic literally ceased in key cities like Pittsburgh. The United States Supreme Court declared the strikes (and all strikes for that matter) illegal. When the strike moved to St. Louis, America stood on the precipice of real insurrection. The Knights of Labor, one of America’s earliest trade unions and the Workingmen’s Party, affiliate of the Marxist International Workingmen’s Association and forerunner of the Socialist Labor Party, led a demonstration into East St. Louis, setting the stage for the first general strike in United States history. Perhaps the most militant outpouring of public anger during the Great Rail Strike, the St. Louis General Strike called for (at the time) radical reforms like an eight-hour workday and abolition of child labor. When a black steamboat worker asked an assembled crowd “Will you stand to us regardless of color?” the crowd uniformly responded, “We will!” Without bloodshed, the strikers took over transportation and other industries. The strike served as the template for later strikes, most importantly the strike wave of the 1930s. Lasting about a month and a half, the strike ended only after President Hayes sent federal troops into combat against American citizens. The Pullman Strike would have been another unremarkable strike of the Gilded Age except for a few things. First, the American Railway Union (ARU) led it. Second, the ARU’s leader was a labor militant named Eugene Victor Debs. The strike began as a protest against wage cuts and 16-hour days. The ARU supported the strike, with many of its members participating directly. ARU workers boycotted Pullman cars, threatening a national strike if rail workers were disciplined for the boycott. Over 100,000 workers walked out, with an intensive campaign of strikebreaking on the part of the Pullman Company. Pullman preferred black labor for this task, capitalizing on the racism frequently employed by ARU. President Grover Cleveland sent out U.S. Marshals and the army to break the strike. Debs got six months in prison for ignoring a court injunction against the strike. During his time in jail he read Karl Marx and became a socialist, setting the stage for five presidential runs between 1900 and 1920. Cleveland and Congress passed a Labor Day law six days after the strike’s end. The strike further underscored the necessity of linking black and white labor for victory. During the dying days of the Hoover administration, life in America was tough. Thus, with record unemployment, the Bonus Army organized. Seeking to collect an early payment on a promised World War I bonus, the Bonus Army massed on Capitol Hill on June 17, 1932, building semi-permanent camps with garbage pulled from a nearby junkyard. Hoover sent the army to violently disperse the Bonus Army, an act that, while successful, sealed the president’s electoral fate. When the army reconvened, in May 1933, Roosevelt gave them a place to camp and three meals per day, leading to the famous quip “Hoover sent the army, Roosevelt sent his wife.” The new president later allowed exemptions from Civilian Conservation Corps rules for W.W. I veterans. Congress overrode Roosevelt’s veto in 1936 to allow World War I veterans to collect their bonus early. The Bonus Army stands as an early example of veterans organizing around veterans’ issues. Beyond merely finalizing the foregone conclusion of a single-term Hoover administration or providing greater access to the CCC, the Bonus Army inspired major labor battles of the next several years. The members showed that movements for social justice could succeed, even in the face of violent repression. The strike against Electric Auto-Lite in Toledo, Ohio, was the first of a triumvirate of strikes in 1934 that forged a new American labor left. After passage of the National Labor Relations Act, union membership swelled. Still, the American Federation of Labor stuck to craft unionism, the principle that unions should be organized by trade, rather than by industry. This made organizing areas like the auto industry difficult. The AFL authorized “federal labor unions,” temporary, cross-union organizations designed to win limited concessions around specific strikes. Auto-Lite workers, organized around FLU 18384 walked out, demanding recognition of their union and a 10 percent increase in wages. Employers met halfway, giving a 5 percent wage increase and offering negotiations later this year. When a contract failed to materialize, workers walked out. The American Workers Party, a mass working-class party led by Dutch Marxist minister A.J. Muste, organized the unemployed to prevent strikebreaking. A little over a month into the strike, demonstrations numbered over 10,000. Sheriff’s deputies began making arrests and beat an elderly worker. Open street fighting erupted between police and strikers, leading to workers seizing a fire hose and turning it back on police. When police began using tear and vomit gas, striking workers attacked the Auto-Lite plant with bricks and stones, burned police cars and appropriated the inner tubes as slingshots. While Auto-Lite picketers battled police, 51 out of 103 union locals voted in favor of a general strike. By the end of the week, violence and street battles died down. While the strike ultimately secured relatively modest reforms — recognition, an additional 5 percent wage increase and a minimum wage of 35 cents per hour — it led to intense unionization in the city. Toledo, OH remains one of the most unionized cities in America today. The Industrial Workers of the World first began organizing longshoremen under the auspices of the Maritime Workers Union. Most longshoremen, however, belonged to a company union, which handled all hiring. The Communist Party, a mass, working-class party at the time, attempted to organize maritime workers under the Maritime Workers Industrial Union, part of its push for red unions during the “third period.” The MWIU never gained mass acceptance, but it did provide a home for aging IWW militants like Harry Bridges. Soon the National Industrial Recovery Act led to a spike in union membership. On the docks, this meant growth in International Longshoreman’s Association numbers. After union leadership accepted an agreement brokered by the Roosevelt Administration and company leaders, the west coast ports exploded. On May 9, 1934 every West Coast port shut down as every longshoreman walked out. Beginning in San Pedro, the strike quickly spread to Oakland, Seattle, Portland and San Francisco. In San Francisco, the longshore strike coincided with a four-day general strike. The more conservative leadership of the general strike assumed command over the entire west coast port strike, dismantling into its constituent parts. Initially considered a defeat, the strike turned out to be more than the sum of its parts. Strikes, albeit localized and cut off from one another, continued as longshoremen and seamen returned to work. Capital on the ports conceded to many smaller demands, further emboldening the workers. After the strike, port locals fined members for working too many hours in a month, “slandering colored brothers” and buying newspapers published by William Randolph Hearst. The ILA later expelled the entire West Coast of the union, which reorganized as the International Longshore and Warehouse Union. ILWU stops work every July 5 to commemorate “Bloody Thursday,” the day of pitched physical battles between labor and capital. The Auto-Lite Strike played a crucial role in growing the Workers’ Party. The West Coast Waterfront Strike led to a rebirth of union militancy. Meanwhile, the Minneapolis Teamster Strike is closely tied to the history of the American Trotskyist movement. Prior to the strike, the International Brotherhood of Teamsters brought new meaning to the term “conservative union.” The IBT opposed strikes in almost any form. Unfortunately, for bosses and conservative union bureaucrats alike, the three Dunne brothers and Carl Skoglund, members of the Communist League of America (Opposition), a group sympathetic to exiled Soviet leader Leon Trotsky, were working in Minneapolis at the time of the strike. They quickly recruited erstwhile Republican truck driver Farrell Dobbs who became a Trotskyist simply because he thought they were the most militant opponents of the trucking bosses. On May 16, 1934 commercial transport in Minneapolis ground to a halt. The striking teamsters allowed farmers to bring their goods directly to grocers, but otherwise the city shut down. Employers formed a goon squad called the Citizen’s Alliance to physically attack striking truckers, hoping to force them back to work. After a brief settlement, the truckers went back on strike, leading to a quasi-general strike — union sympathy boycotts of “hot goods” would have shut down the entire city had truck drivers not taken turns delivering essential goods. The strike lead to the inclusion of “inside” workers (helpers and warehousers), but had more lasting effects. It took explicitly anti-communist legislation to get socialists out of the Minneapolis local’s leadership. Farrell Dobbs organized over-the-road truckers throughout the entire Midwest as a prelude to his career as a Socialist Workers Party National Secretary and four-time presidential candidate. Hot on the heels of the strike, the Communist League of America merged with the Workers Party before entering the Socialist Party together. This forged the largest socialist party opposed to Stalinism in American history. An aftershock to the three great strikes of the 1930s, the Flint Sit-Down Strike set new benchmarks for labor militancy in the United States. When the UAW picked a fight with GM in Flint, it had its work cut out for them. Flint was a company town and GM kept spies in the plants to prevent unionization. Taking inspiration from the European workers’ movement, American workers no longer felt content with pickets. Instead, they occupied the factories, making bringing in strikebreakers as dangerous as entering a hornet’s nest. Faced with a tough fight in Flint, UAW workers occupied the factory, electing their own officials and organizing food deliveries. When the police attempted to turn a firehouse on the strikers, the workers seized the hose and turned it on the police — in the middle of a Michigan January. When cops attempted to retake the factory with tear gas, the strikers’ wives threw rocks through the windows, keeping the tear gas from collecting in the building. When the AFL didn’t meet workers’ needs they formed the IWW and then the CIO. When the UAW no longer met the needs of black workers at Dodge Main in Detroit, they formed the Dodge Revolutionary Union Movement (DRUM). In 1968, the vast majority of union officials were white. At the Dodge Main plant, 70 percent of workers were black. The first black revolutionary union, DRUM, organized as a caucus within UAW, quickly winning the ear of black labor militants eager for reform both within Chrysler and UAW. In July of ’68, DRUM led a wildcat strike against dangerous working conditions in Dodge Main. Over 4,000 workers walked out, preventing 3,000 cars from coming off the assembly line. DRUM soon ran as a slate in the Local 3 election. While they lost, they inspired similar movements at other plants. The nascent movement coalesced around the League of Revolutionary Black Workers. The shop-level movement began falling apart quickly with the national movement quickly co-opted by the Maoist- and New Left-influenced New Communist Movement. Still, the movement inspired left activists to think outside the box — and the Democratic Party. Every American uprising, no matter how seemingly successful, has limitations. Conversely, every American uprising, no matter how seemingly impotent, contains powerful lessons for future movements. While we can be inspired by movements of the past, cheerleading is always counterproductive. Rather, we should critically examine social movements, always looking to emulate the best and eschew the worst. From the Lowell Women’s Mill Strike to Occupy Wall Street to whatever the next American uprising is, learning history’s lessons is a crucial part of the struggle for those who want to fight and win. Nicholas Pell is a freelance writer based out of Los Angeles. Follow him on Twitter @NicholasPell. This piece was earlier published at Alternet.